Prior to nuc pickup, the empty hive (i.e. bottom board, hive body, five or six frames of foundation and/or comb, entrance reducer, inner cover, outer cover, empty hive body, sugar syrup, feeder) should be assembled and prepared for installation. The hive should be located at the apiary site in accordance with the MSBA’s “Best Management Practices for Beekeeping” found at mainebeekeepers.org. In addition, the apiary should have: shelter from prevailing winds, good air drainage, a southern sunny exposure and no danger of flooding. If the empty hive contains comb and/or frames of honey, it should be screened or made bee-tight prior to installing the nuc so other bees in the area aren’t attracted to it and/or don’t rob its honey prior to installing the nuc. Coordinate the nuc pickup with the seller. The ideal times to pickup nuclei are early in the day, during the evening, or during rainy weather since the field bees are within the nuc and temperatures tend to be cooler, for optimal transport. Prior to pickup, the nuc producer usually has the nuc screened and secured for transportation. Adequate ventilation is very important in order to prevent overheating and suffocation of bees and brood. Ventilation methods vary according to where the nucs were produced and the distance they were shipped. Many nuc designs have both an entrance screen and rimmed top screen for bee cluster space. Another common design has a screened entrance and partially screened sides. The sides have removable wooden slats on the lower part of the nuc that expose screens for transport. The 8-mesh screen is most commonly used for ventilation and is superior to window screen since it allows maximum airflow. Frequently, northern nuc boxes have only a lower entrance or 3/4″ – 1″ auger holes bored through the front and sides of the nuc box. When transporting the latter design, all of the holes should be screened with 8-mesh hardware cloth. Styrofoam nuc boxes are more prone to overheat- ing unless there is adequate upper or side ventilation. When loading nucs on or into a vehicle, make sure they are stabile and will not shift or topple, and ensure that the vents aren’t obstructed by another nuc during transport. At times it may be necessary to separate nucs with side vents via pieces of lumber or strapping. When transporting nucs in a car or van, turn on the air conditioner if the bees become noisy or if the vehicle gets too warm. Do not transport nucs long distances or during warm-hot weather without adequate ventilation. Upon arrival, put on protective gear, light a smoker and gently puff the nuc entrance with two or three wafts of cool smoke. If the nuc was transported within a vehicle, remove it prior to smoking. 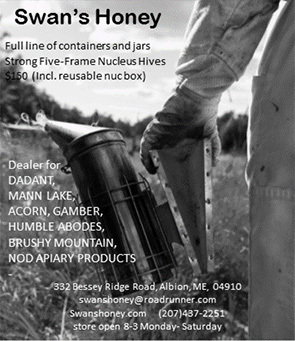 Unload the nuc and place it next to or on top of the empty hive it will inhabit and remove the front entrance screen. Depending upon the weather and time of day, the nuc can be installed the same day or delayed for one or more days until time and weather permit. If installation is scheduled for another day, replace the side ventilation slats and remove and/or cover the screened top with the wood or Styrofoam nuc lid. The most important things to accomplish upon arrival are moving the nuc to the exact location where it is to be hived and removing the front entrance screen so the bees can fly. Gently smoke the nuc entrance with three or four puffs of cool smoke. Place the nuc beside the empty hive if it had been set atop it on arrival day. Remove the outer and inner cover of the hive body, insert the entrance reducer and remove two or more frames of foundation or comb and lean them on the side of the hive opposite the nuc. Spread out the remaining frames of foundation/comb to the edges of the hive body. Gently pry the cover off the nuc and gently waft smoke over the bees and top bars of the nuc. Use minimal smoke so the bees aren’t agitated and so the queen is less likely to leave the comb and hide on the bottom or wall of the nuc box. While standing next to the nuc, remove the outermost frame (one near you) by gently pulling the frame straight up in order to avoid crushing the bees on this frame and the adjacent frame. This first frame will probably contain honey and pollen and it should be placed toward the center of the hive body. Pry apart and remove the frames of bees from the nuc and situate them in the hive body in the same order and orientation as they had been in the nuc. Center the transferred nuc frames and slide the remaining frames in the hive body toward the nuc frames. Replace the remaining frames of foundation and/or comb on either side toward the hive walls. If there are frames of comb and foundation available at nuc installation time, situate the comb on either side of the nuc frames and place the frames of foundation toward the walls. If only foundation is available, place it on either side of the centered nuc. Before placing the inner cover on the transferred nuc, check the re- maining bees on the bottom board and walls of the nuc box for the queen. If she is still among the bees remaining in the nuc box, gen- tly thump the rear corner of the nuc box on the ground. The bees can then be poured into the hive by inverting the nuc box over it and giving it a shake so the bees fall into the hive body. If the queen isn’t visible, still perform the same procedure to remove the remain- ing bees from the nuc box. After the remaining (“shook”) bees have moved off the top bars down onto the combs, place the inner cover on the hive. If the bees are slow to move, gently apply smoke. Place an inverted feed jar, can or bucket of 1 : 1 sugar syrup (sugar : water) directly above the inner cover hole so the bees below have direct access to holes or screen. Place an empty hive body (or supers) above the inner cover (for protection of syrup) and outer cover on top. Put the empty nuc box in a shed, etc., away from the hive. After a few days, check syrup consumption and feed if necessary. Additional syrup will be needed according to container size, weath- er and flower conditions. After one week, check the hive. Assess queen and brood conditions and add a second hive body when the bees have drawn two-thirds of the foundation into comb. Necessity for additional feed will continue to be influenced by weather and plant conditions.